I love sweet potatoes and I LOVE pancakes. I was going to try making these in a waffle maker initially but I thought during my initial experimentation that it would be better to test the mixture before letting it get stuck in waffle machine crevices. They worked well as pancakes and were a delicious and healthy breakfast. You could prepare the batter in advance but its fairly easy to whip up on the day using some pre roasted sweet potato. We eat a lot of sweet potatoes here whether cut into wedges or chips for orange chips as my girls call them or roasted then scooped out for instant mash. I tend to batch bake them as they keep well for a few days afterwards and I love having them on hand for quick, nutritious meals for the girls ( and us of course ). I like to throw them into soup for a delicious creamy thickness and to top bolognese for my twist on cottage pie. I created these on one of those days where all you want to do is eat. I wanted all the gooey cheese and chocolate as well as pancakes..cakes and bread. 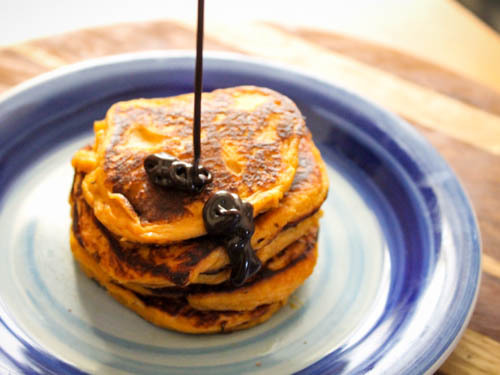 I thought it may be nice to try out some pancake ideas that were a little healthier than the ones I normally make and that could also use up some of my leftover sweet potato. Firstly beat your sweet potato with your egg until smooth, add remaining ingredients aside from your milk and mix well. Now add your milk a little at a time until you are happy with the thickness of your batter. Place a large frying pan over a medium to high heat and when very hot add your oil. Now in small batches using about a heaped tbsp of batter for each small pancake, slowly lower your batter gently smoothing out the top to create small rounds in the pan. Cook for a few minutes on one side before flipping ( carefully-these are a different consistency to normal pancakes ) and cooking the other side. Remove from pan and dive in. These are really good served with a drizzle of maple syrup or choc shot ( a low calorie chocolate syrup made from carob and fruit extracts ). I’ve also enjoyed them with griddled bananas. Yes they don’t taste exactly like normal pancakes and I won’t lie when I say I still appreciate the beauty of buttermilk pancakes fried in melted butter with lashings of syrup and crispy bacon on top but they are a pretty good replacement! * These could easily be made using a soya/coconut/almond milk to make this suitable for dairy intolerant or vegan guests. These sound and look so delicious! I love sweet potatoes! 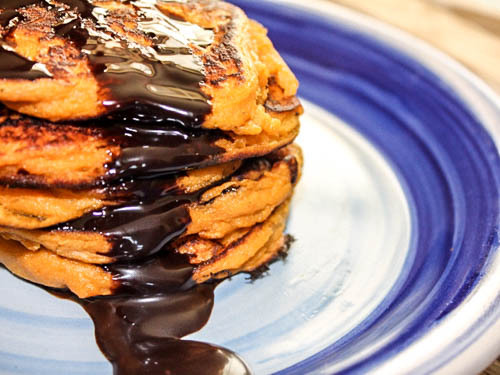 Sweet potatoes in a pancake? Yes!! They look delish and we know sweet potatoes are so nutritious. Great post! Looks good! Do you think they’d work if the flour was subbed for protein powder? I also love sweet potatoes and pancakes, what a winning combination! 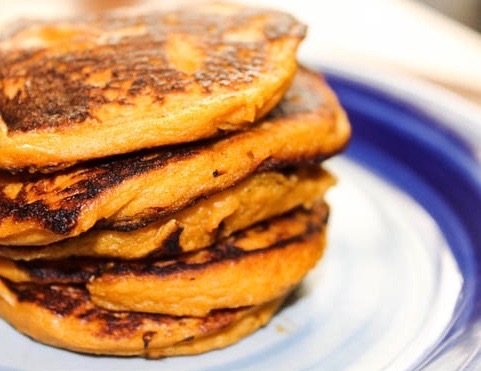 Wow I’d have never thought about putting sweet potato in pancakes until I saw this post but what a great idea! They look delicious 🙂 pancakes for breakfast is one of the things I miss the most when on a diet. Not any more! Love the colour of these pancakes and I suspect I’d like the flavour too. We don’t eat enough sweet potatoes and really should have more as they are delicious. I’ve not tried making carob ‘chocolate’ sauce before, brilliant idea. Will have to try it.